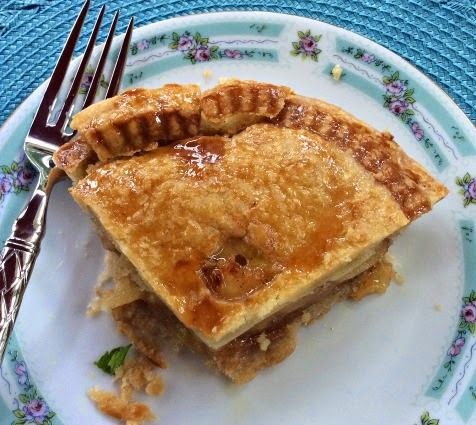 Who does not love a cold, fruity slice of apple pie on a warm summer day? Americans love apple pie! It has long been the traditional dessert choice for the all American 4th of July Holiday. There’s something magical about a buttery, flaky crust baked around a sweet filling. This recipe is for a Healthier GF/DF Apple Pie, and although this pie is healthier it clearly does not compromise the great taste of that pie your mom used to make! My pie crust recipe can of course also be used to house any other pie fillings of your choice whether it be fruity or even a meat or vegetarian pot pie. 2 cups of All Purpose Gluten Free Flour Note: I like to use King Arthur's Brand. Mix together the Gluten Free Flour along with the salt and sweetener of your choice. Add in coconut oil, and mix until crumbly. Add in egg/egg replacer and mix until well incorporated. Note: The mixture will remain crumbly. Add the water by stirring in 1 tablespoon at a time until dough holds together for rolling. Best if dough is a little moist and not too dry. Cut dough mixture in half and roll into 2 balls (one for each crust). Shape dough balls into disc shapes with floured hands and place onto a sheet of floured parchment or wax paper. Cover with an additional sheet of parchment or wax paper. Roll crust out slightly larger than your pie tin. Remove top parchment/wax paper and slip hand gently under the bottom paper to flip into pie tin, carefully peeling back the paper as you press it into the pan. Do not worry if it breaks apart a little, you can always press it together and it will look fine! Crimp edges of crust to make a decorative edge or top with an additional crust layer after adding your pie filling. Fill with your favorite recipe and bake. Preheat oven to 350 degrees.In a small saucepan, heat the apples, cinnamon, allspice and maple syrup on low heat for about five minutes, until the apples are softened. Add the filling to your bottom crust. Roll out your pie crust between two sheets of parchment paper for your top crust. You can cut your crust with small decorative cookie cutters, or roll out a flat top crust. Slit several steam vents in the top crust, if you choose to do the latter. Bake the pie for 22 to 25 minutes or until golden brown on top. Allow pie to cool a bit before serving. Enjoy! Looks so good! You can never have enough apple pie recipes. ;) Thanks for sharing at Savoring Saturdays!